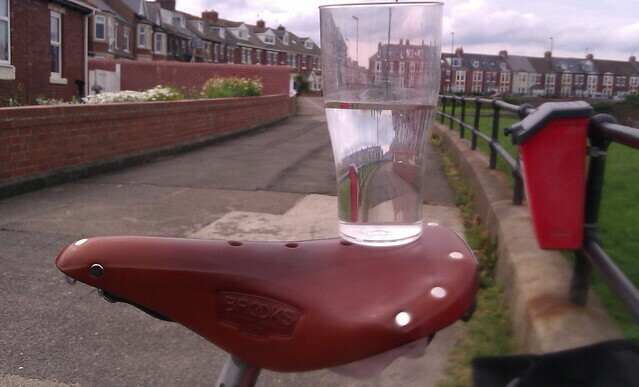 Home › Bike Culture › Cycling: Glass Half Empty or Half Full? Cycling: Glass Half Empty or Half Full? It’s a week since David Cameron announced the winners of the Cycle City Ambition Fund. It got quite a lot of coverage – most of the winners were suitably enthusiastic. But there were also questions as to the nature of the bidding process, and the rather limited size of the budget. 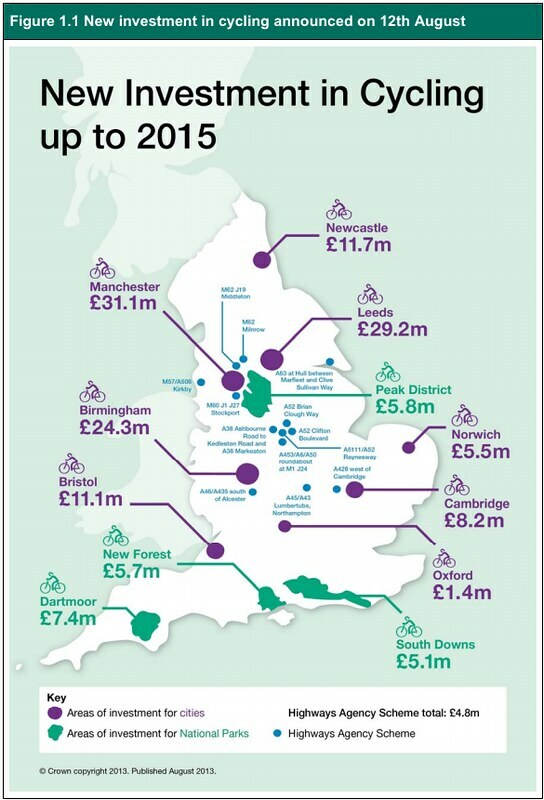 With a total of £94M awarded by the DfT, and £45M of local match funding, it works out at £9.71 per person per year in each of the winning cities. The cities’ budget is £122.5m, with the balance being spent in national parks. Compare this with the Netherlands, where for a population of 16.7 million, they spent €410M in 2012. That’s €24.40 per person – around £20.80, and is considered their normal level of spending. Note HS2’s budget of £300m is more than twice what cycling is to get over two years, and that this figure for 2012/13 only. The whole life cost of HS2 currently stands at £32.7bn £43bn an anticipated £83bn. And you thought hyper-inflation was for banana republics and the 1970s. 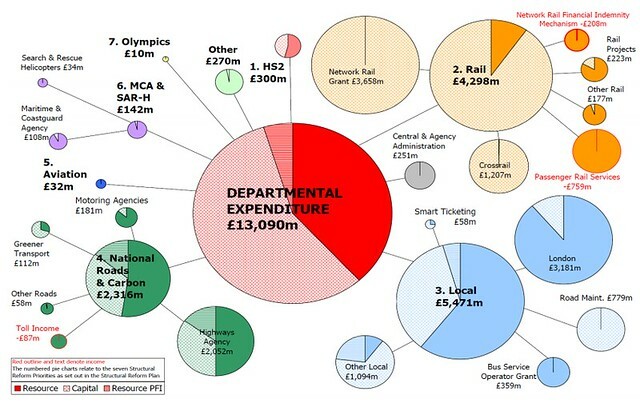 In fact, as @roadccdave noted on Twitter, DfT budgets are generally expressed in billions rather than just millions. Locally, there’s some work scheduled for the junction of the Coast Road and A19 at Silverlink. This is forecast to cost £140m, and is to remodel just a single roundabout. 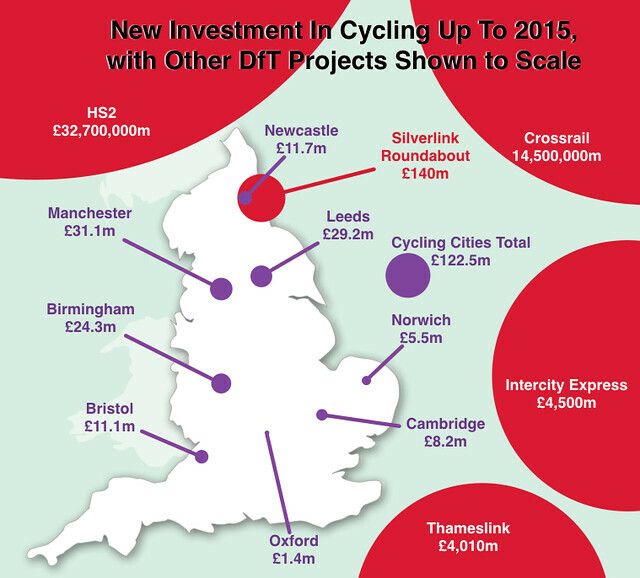 That’s equal to the entire national spend on cycling that was announced last week. So it could be easy to see this glass as being half empty: Cycling is getting just 0.53% of the DfT’s annual budget, and so it’s little wonder that it’s stuck at around 2% of modal share. True, it only covers seven cities, and misses out places like Leicester. London, being an independent city state isn’t included either, but as Boris is promising to spend around a £billion, does that matter? While I would like to see the DfT have also come up with a set of mandatory, nation-wide specifications for cycle infrastructure, I’ve also seen that a lot of change is about what we can get done locally. Don’t get me wrong – a statutory duty on local authorities to build cycling into new schemes and retrofit it to the existing streets, and for this to be done to a properly defined high standard is essential. The floated and sunk Office for Active Travel could have done this (and coincidentally would have had a budget of £1bn a year – almost in line with what the Dutch would expect), but that didn’t happen this time round. So right now, each of us can probably make a bigger change to our own streets than a whole lorry load of Whitehall consultation on any new specifications would ever manage. And we can do it within our own lifetimes, while our children can experience the benefits. “Central to Newcastle’s bid is linking employment and training opportunities to new housing developments in Newcastle and to existing communities where people are currently least likely to cycle. Newcastle plans a network of 7 major cycle routes across the city making the best use of existing infrastructure and linking in with the major improvements currently underway in the city centre. “This government investment will be supported by an Active Travel Centre where people can go for cycle maintenance, parking and information. Recognising the potential for cycling, almost a million of public health funding in Newcastle is being invested in this initiative. This is great stuff, and each of the other cities have equally ambitious aims. The only question remaining in each of the winning cities is whether or not their councillors and officers responsible for putting these plans into action really understand what they’ve got. Put simply, do they have the AMBITION to make cycling the safe, convenient and obvious choice, or will they fritter away the time and money to maintain the status quo? ‹ What Would Jesus Ride? Nice post – you could repeat that analysis in almost every country in Europe and get a similar result. Its not just UK vs Netherlands, its everyone else trying to keep up too. So the analysis everyone keeps missing is why everyone else except NL also gets good growth from their small investments and UK hardly moves. Your final comment is where my analysis ends up deciding the problem really is! The last sentence is where it’s at. the money is almost incidental and it’s sad that that’s been the headliner. As you say, it’s ambition and high quality coherent designs that are needed. A requirement on all LAs to include cycling at the very all schemes would help those many many towns, villages and cities that didn’t get any special funding. I’d also like to see a fund for minor works in each area fed from a “suggestion box” where small nudges4cycling (thanks Carlton!) could be suggested. Enforce a requirement similar to FOI requests where the suggestion has to be reviewed in a set time frame, and then completed unless a strong mitigating reason against can be given and has to be published.